Im walking towards the kitchen & I see a bird on the back porch acting strange. I go to the door to try to scare it away and I see another bird down the steps kind of freaking out. I had to go see what they were freaking out about and as soon as i opened the door i saw this little guy trying to get away from the birds. 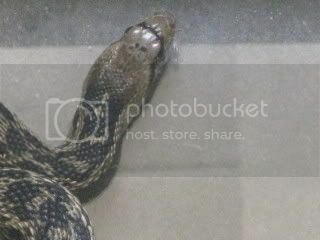 So I scare the birds away and Im excited because this is the first snake I have seen around my house in a few years. 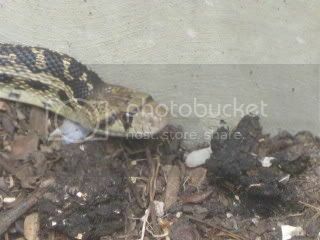 I run inside & grab the camera and take a about 10 pix without disturbing him, then i went ahead and grabbed a glove to pick him up. 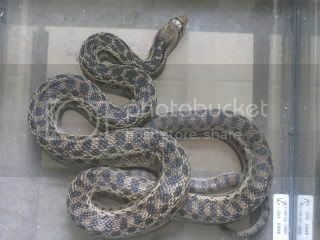 I think its a san diego gopher snake but Im not 100% sure. Can any1 tell from these pixx? And it was pretty cool because I got to see what my zoology teacher was telling me about certain snakes rattling their tail against brush to imitate the sounds of a rattlesnake. 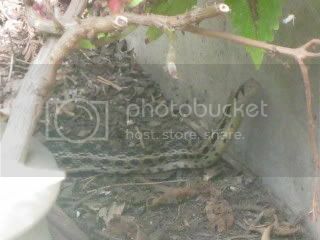 After I took my pix I let him calm down then released him into a bushy patch on the other side of the steps that has a bit more cover. Very cool find, easily a Pituophis. Did it hiss when you tried to pick it up? It actually didnt hiss at all. It did the tail rattling a little but it wasnt very good bcuz there wasnt that much loosh brush around. It did flatten out its head tho. & when i picked it up the only thing it did was wrap part of its body around my arm. Check out the links below. This site is VERY handy to help identifying Snakes, Lizards,Turtles, Frogs, and salamanders. One if the full site and if you click on what you are looking for you will see pics of whatever species you want to look up. Then if you click on the Scientific Name it will bring you to another page with more pics of the sub species and info about it. This link will help you see WHERE and WHAT subspecies are located in the map. And it also shows pics to compare. Hope this helps. I find it a GREAT resource when I am trying to ID something or which sub-species..